After an exquisite display of matches during ESL One Belo Horizonte 2018, CS:GO betting fans from all over the world want more! Sure, there are some minors going around at the moment, but in a couple of days (or more, depends on when you're reading this) begins a new ESL One tournament… the iconic one – Cologne! Time after time, the entire eSports community is returning back to Cologne for another grand spectacle to be unveiled. eSports betting fans will be thrilled and, needless to say, looking forward to another brilliant array of matches. So, what are we waiting for here? Let's see what exactly awaits us at this top tier CS:GO tournament! ESL One Cologne will keep the traditional ESL One tournament style featuring both Group Stage and Playoffs. Since this is a 16-team tournament, there will be 2 double-elimination groups with 8 teams each. The group draw will be decided on the ESL CS:GO World Rankings and both of our group tables will be updated accordingly, prior to the first ESL One Cologne 2018 betting odds become available. Top 3 teams from each group advance to the playoffs. 1st placed go straight through to the semifinals while 2nd and 3rd placed will have to battle their way through the quarterfinals. Both of these are played in Bo3 fashion while the grand final matches will be played as Bo5. With just a couple of days before ESL One Cologne 2018 comes to the spotlight of eSports betting fans from all around the world, we finally have some concrete betting odds to tell you about. With that in mind, take a closer look down below where you can find the best ESL One Cologne 2018 betting odds as well as in-depth comparisons between the most popular eSports bookies out there. 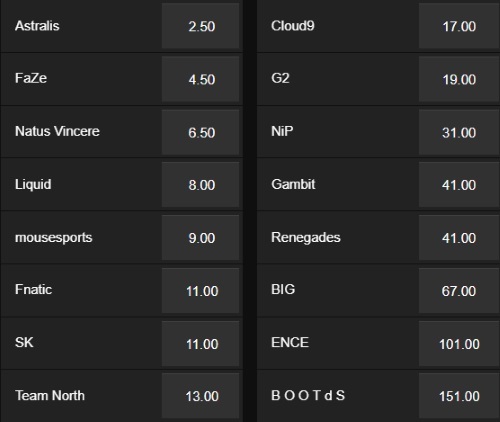 CS:GO bets are usually quite difficult to predict due to the high dynamic in games. However, that still doesn't mean some bookies have them better than others. 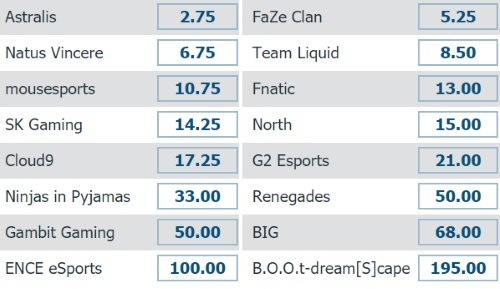 With all that in mind, let's start taking a closer look at the array of CS:GO betting odds that the most popular eSports bookmakers have in store for us! As far as livestreaming is concerned, you can rest assured a huge eSports organization such as ESL will have plenty of high-quality coverage. More precisely, streams will be available on the official ESL channels in multiple languages including English, Portuguese, German, French, Russian, Polish, Spanish and Turkish.